Taylor Swift’s best facebook posts are just like the rest of Taylor’s social media accounts, a work of art. She is one of the most popular singers worldwide, and part of her success is her ability to connect personally to her fans. Fans love her Facebook page (alongside her Instagram!) so they can stay in touch with her and catch a glimpse at her life. Her Facebook page has over 74,062,000 fans that like her page! See again some of Taylor Swift’s best Facebook posts, and you too will feel almost like you know this girl personally. Is her life one giant night in hanging with your squad? 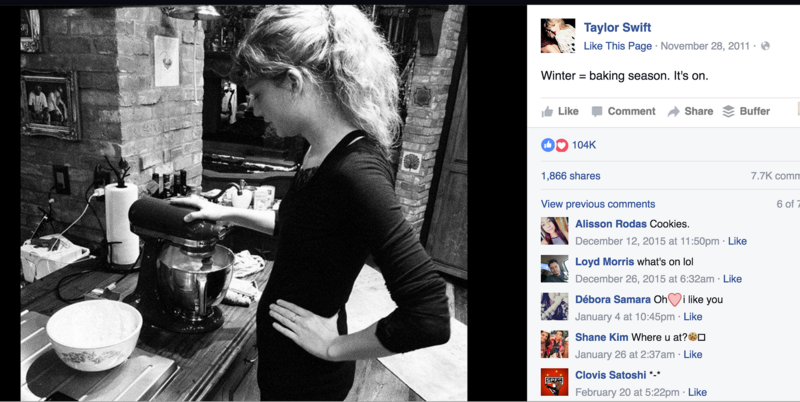 November 28, 2011– Taylor’s status reads, “Winter=baking season. It’s on.” This post has 104,364 likes and 7,753 comments. This B&W photo features Taylor using a kitchen mixer and you know there is a yummy recipe in there. December 2, 2011– Status says. “Aw! 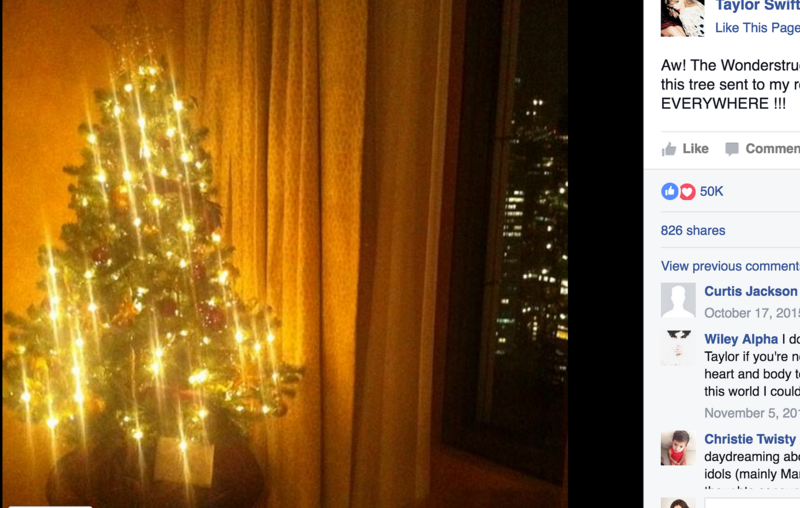 The Wonderstruck team at Elizabeth Arden has this tree sent to my room in NYC! It’s Christmas EVERYWHERE!” The post features 50,782 likes and 4,606 comments. Wonderstruck is the name of Taylor’s women’s fragrance, released in October of 2011 by Elizabeth Arden. December 29, 2014– Status reads, “I decided today that when my friends’ children come over, I’ll feed them chocolate chips and let them jump on the furniture.” Tagged- Joy Williams. This status has 403,485 likes and 4,593 comments. Joy is part of the country group, The Civil Wars, along with John Paul White. The group collaborated with Taylor on the song Safe & Sound from the album The Hunger Games Songs from District 12 and Beyond. July 29, 2015– Status quote; “Meeting my boy.” Tagged- Jamie King and Kyle Newman. This status features 483,929 likes and 4,080 comments. 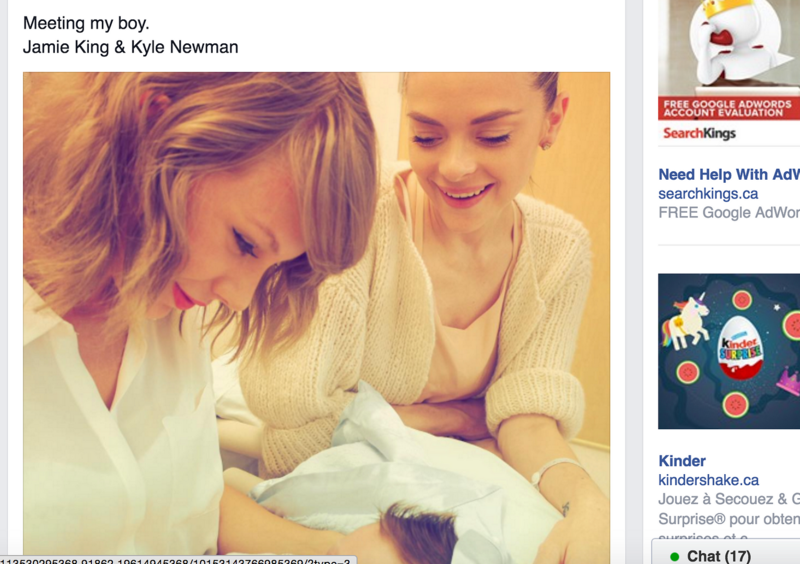 Taylor is the godmother to Leo Thames Newman, the son of Jaime King and Kyle Newman, born July 16, 2015. August 3, 2015– Status says, “Some of my best times are with her, laughing in the kitchen. Happy Birthday to the ray of light that is Karlie Kloss.” The status has 475,063 likes and 3,702 comments. Taylor and supermodel Karlie Kloss have been good friends since they met in November of 2013 when Taylor was performing at the Victoria Secret Show. September 22, 2015– Status reads, “Finally got to meet Dylan, the 7-yeard old who passionately danced to Shake It Off on Ellen- and this happened.” This post features 504,392 likes and 11,294 comments. The video featuring Taylor and Dylan has had 8.5 million views. Dylan Barnes added a video of him dancing to Shake It Off on his Facebook page, The Red Headed Persian Entertainer, on August 5, 2015, and it quickly went viral. Dylan appeared on The Ellen DeGeneres Show on September 18, 2015. 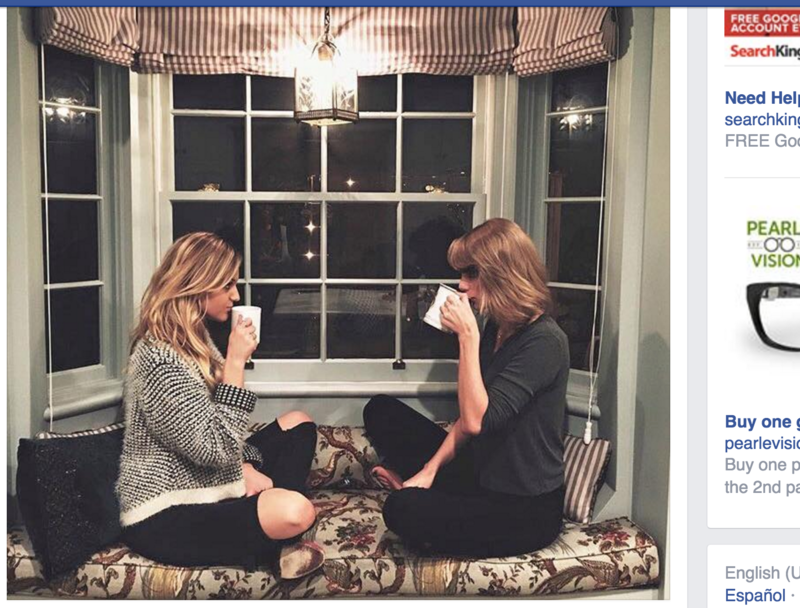 January 26, 2016– Status quote, “Coffee//LOLs//window seat//girl’s night in//Kelsea Ballerini.” This post has 358,027 likes and 3,911 comments. Taylor wrapped up her 1989 World Tour in December and was enjoying some down time with her good friend Kelsea Ballerini. 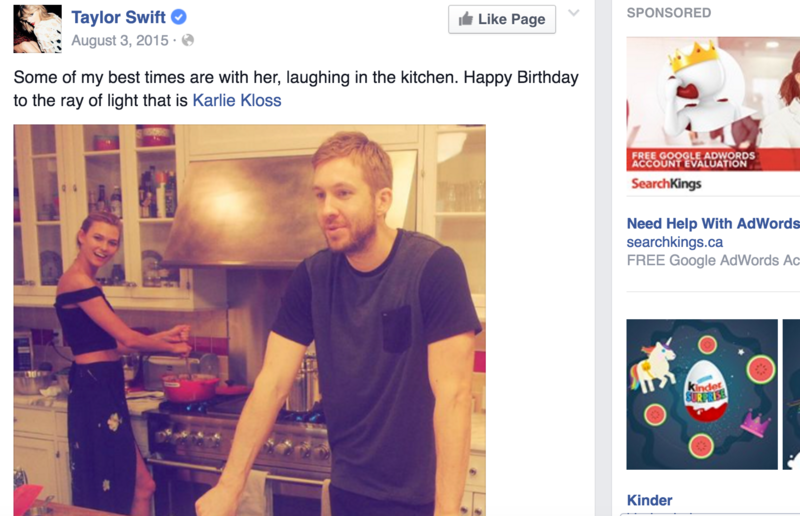 So which of these Taylor Swift’s best Facebook statuses was your fav? I think the dance off is mine! Tell me your fav in the comments!